the Supreme Court (sc) has imposed perhaps the biggest fine against a public interest petitioner, ending a three-year-long controversy over the classification of a 15-hectare plot in Korba district, Chhattisgarh. It ruled the plot was not forestland (see 'Matter of interpretation', Down To Earth, April 30, 2006). The court dismissed petitioner Deepak Agarwal's case and slapped a fine of Rs 1,00,000 on him, saying his application was misconceived and mala fide, and had made the Central Empowered Committee (cec, which advises the court on disputes over forestland) incur huge expenses. Reprimanding the petitoner, the court said: "The court must be careful to see that (a) member of the public, who approaches the court in public interest, is acting bona fide and not for any personal gain, private profit or political motivation or other oblique considerations." Besides, the sc has also questioned the credibility of the ngo, Bilaspur Environment Society, which supposedly assisted Agarwal and paid him Rs 55,000 to obtain the satellite images. The court upheld cec's second report supported by another one based on satellite imagery -- and said, "The land in question is not a forestland and was never formally merged with Ratija village during the land settlement carried out in 1928-29. 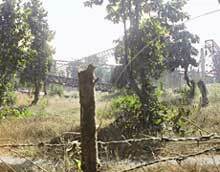 In fact, it is a part of village Nawagaon Khurd." However, cec's first report had designated the plot as forestland. In 2003, Agarwal had approached the court, claiming the plot was forestland and part of Ratija village. The state government had allotted it to Maruti Clean Coal Limited for a coal washery without requisite clearances. Agarwal had also claimed the plot was wrongly showed as part of Nawagaonkhurd village in revenue records. In its defence, Maruti had argued that the petition was motivated by the interests of another company that had mining interests in the area.